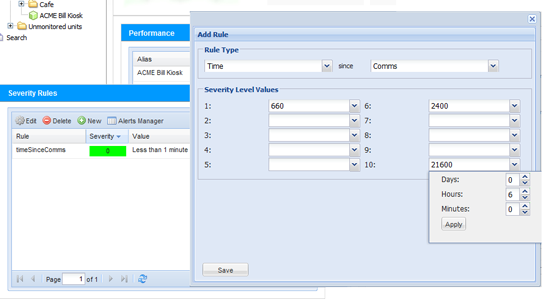 Genkiosk supports alerts based on severity, you can create alerts for different severity levels from 0-10; where 0 is operating OK and 10 is critical. Notifications can be sent based on the severity and the time since the severity level occurred. Some examples of business rules in action. First line support may need to know all the kiosks at severity 6 or above, and 2nd line support need to be notified if the severity level has been active for more then 6 hours. A bill payment kiosk in a shopping mall may be considered faulty if it has had no use in 2 hours, but another in a out of town petrol station may only get visited once a day. Each site can reach severity 6 after a different time, reducing unnecessary engineer visits.